There are Snickers, Skittles, Laffy-Taffy, and Nerds. Milky-Ways, Three Musketeers, and Tootsie Rolls. But there is something about a candy corn. I always used to trade my other good candy to get the candy corn. Ya’ll can keep the good stuff… I just like them. And I like these cupcakes. I am not a food coloring expert. The food coloring was super bright in the bowl when I was making the batter, and ended up baking much lighter. You could adjust it as your mixing to make it more orange. The yellow color was perfect. This cake is very moist and buttery. Enjoy your Halloween this weekend! Eat lots of candy. Make these cupcakes. Be a kid. Laugh alot. Giggle at your brother dressed like DJ Lance from Yo Gabba Gabba. I did last night at a Halloween Party. He ran into his ex-girlfriend from 15 years ago. I giggled a little more. All in good fun. Pre-heat the oven to 325 F. Lightly coat the cups of a cupcake baking pan with baking spray. In a medium bowl, sift together the flour, baking powder and salt. In another bowl, use an electric mixer to beat together the butter and sugar. Beat for 5 minutes, until very light and fluffy. Beat in the vanilla extract. Put the whole eggs, yoks, and cream into a liquid measuring cup. If you don’t have one, put them in a medium sized bowl. Beat this mixture together. Pour the egg mixture a little bit at a time into the butter/sugar mixture and beat for about 5 minutes. Using a spoon or silicone spatula, gently but thoroughly fold the flour mixture into the butter and egg mixture. Divide the batter into 2 bowls, one having slightly more batter than the other. Add several drops of yellow food coloring to the bowl with slightly more batter (I added about 8 drops), fold in the yellow until it is a nice, even color. In the other bowl with the remaining batter, add about 4-8 drops of the orange coloring and fold it in until evenly colored. Divide the orange batter between the cups of the prepared muffin tin. Carefully scoop the yellow batter over the orange batter (I used a small ice-cream scooper).Now you have the orange layer on the bottom and yellow on top. Bake for 20 to 25 minutes, or until a toothpick inserted at the center comes out clean. Allow to cool for 5 minutes, then transfer to a rack to finish cooling. Once the cupcakes have cooled, prepare the frosting. In a large bowl, use an electric mixer to beat together the butter, sugar and milk until smooth and creamy. Add the vanilla and beat to combine. When the cupcakes have cooled, overturn them so the orange part is on top. You may have to trim the yellow part to make it nice and flat with a serrated knife. Transfer the frosting to a zip-close bag. Cut off one corner of the bag, then squeeze the frosting into a slightly pointed mound on top of each cupcake. Oh my gosh, what a great idea! Candy corn is so fun, and I love how they aren't complicated to decorate either. Thanks for sharing! And Happy Halloween!!! I'm with you. Candy corn is the best! I love how simple these are. Thanks for sharing with us. Cute idea..my kids would gobble these up! Those are SO cute, I love them! 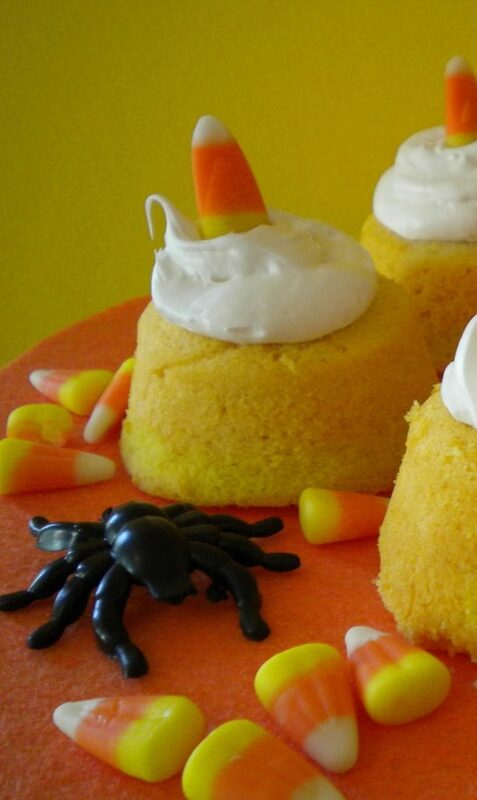 You know I'm a Halloween fanatic so when I saw that you made Candy Corn Cupcakes, I got way too excited. They look so wonderful and tasty. YUM! I love candy corn too, I swear I could eat a million of them. Yes! There is just something about candy corn. These need to get made tonight! Thank you so much for sharing, and I'm sorry if I've been a bit absent lately…we are just dealing with so much around here. Have a Happy Halloween! These look so fun for Halloween! Hope you have a safe weekend and enjoy! It's awesome how you did this! 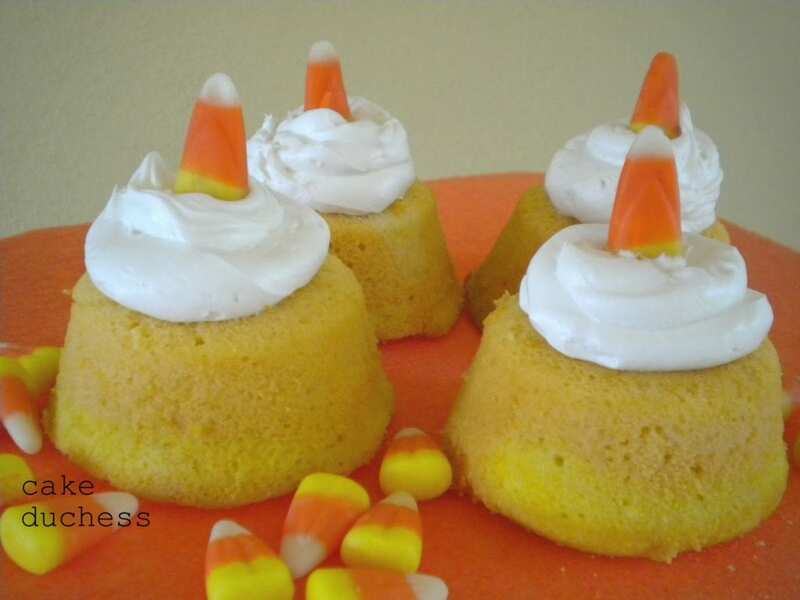 I am not a candy corn fan, but the cupcakes are marvelous! Wonderful! And yes, I'm a candy corn freak, too. LOL! Saving this! I love candy corn too! I get a bag for the office and a bag for home 🙂 These look delicious! Halloween isn't complete without a little candy corn! I love these cupcakes 🙂 Hope you had a great Halloween! this look awesome! what a cute little cupcakes:) thank you for sharing this. I admit that candy corn is one of my pleasures just around Halloween too. I'm not much into sweets at all, but there's just something about them. Your cupcakes are wonderful. I couldn't do any better with the coloring (I cook, I don't bake). Great job. I love your cupcake recipes, they look so delicious!